Head to The KITCHEN for April vacation and enjoy hands-on activities that celebrate local, seasonal food and local farmers and food artisans. The classes are taught by chefs who tell first-hand stories about where and how the ingredients are grown. 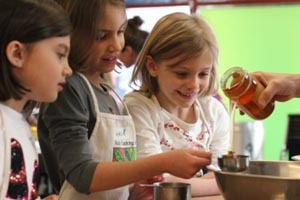 Children will create each dish and at the end of class, eat what they've made. Classes are offered on Monday, Thursday and Friday of April Vacation Week. There are two sessions: the first for children ages 4-7 and the second for ages 7-12. Parents must stay in The KITCHEN during the class. If your child has an allergy, please email kitcheninfo@thetrustees.org at least 3 days in advance to inquire about the recipes. Unfortunately, recipes cannot be modified for these events.